Founded in 1972, Carsem is a leading provider of turnkey packaging and test services to the semiconductor industry, offering one of the largest package and test portfolios in the world. 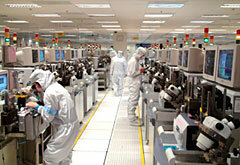 The semiconductor assembly and test businesses are undertaken by Carsem (M) and Carsem Suzhou. The current combined operations of both companies, also known as "Carsem", makes it one of the largest independent semiconductor sub-contract assembly house in the world, producing over 100 million units per week with more than 65% of this volume is shipped as fully tested products. Carsem's product offering covers the widest package range in the industry from simple low pin count micro devices to the more advanced high pin counts and high value packages. Carsem's end-market is relatively diversified due to Carsem's wide range of integrated circuits packages. Carsem also provides a full range of turnkey test services for radio frequency, mixed-signal, analog, digital and power devices. This flexibility in product offerings allows Carsem to supply to different market sectors, such as the industrial, telecommunications, information technology, consumer (including smartphone and tablet) and automotive sectors thus avoiding over-dependence on any particular sector. Carsem also offers full final test services, supported by extensive R&D and failure analysis laboratories. Carsem (M) has two plants located in Ipoh, Perak, Malaysia, while Carsem Suzhou is located in the Suzhou Industrial Park in Jiangsu province, China. In 2011, Carsem Suzhou built a second factory in Suzhou, greatly expanding its capacity in offering assembly and test for the MLP (Micro Leadframe /QFN Format) packages. Carsem is supported by a global network of sales and technical support offices with marketing agents in Japan and marketing offices in Taiwan, Los Angeles, Boston, Dallas and in the Silicon Valley in the United States and in the United Kingdom. Carsem's factories maintain world-class quality standards. All factories have achieved ISO/TS 16949, ISO 9001, ISO 14001 certifications and comply with the Sony Green Partner Program. DCI was originally set up in 1974 as a subsidiary of an USA-based multinational company, providing semiconductor leadframe and semiconductor materials support to their IC assembly plants in the Asia Pacific region. In January 1996, DCI was acquired by MPI and became a member of the Hong Leong Group Malaysia. DCI is one of the largest manufacturers of leadframes in the world. DCI leads the industry in design, manufacture and supply of microelectronic packaging systems. DCI's main line of leadframe products are in stamped, etched and cerdip leadframes. Leadframes are used in a broad range of electronic products: home computers, automotive components, telecommunications, toys and electronic games. DCI supplies semiconductor manufacturers and assembly contractors with the packaging needed to connect the chips to their products. DCI is a ISO/TS 16949 certified company and it manufactures leadframes that conform to the standards of JEDEC and EIAJ package outlines such as MQFP, PLCC, SOIC, MDIP, TQFP, TSSOP, TSOP, SSOP, SOT, MLP (QFN) and CERDIP. DCI operates its factories from two locations in the Bayan Lepas Free Industrial Zone in Penang, Malaysia.